The main function of project is to develop one-file utilities for zipping. A user can use very user friendly UI for selecting files for zipping and unzipping. The application should be able to generate Zip files using the utility. It includes two types of interfacing as mentioned. It includes interfacing zipping and unzipping the files and folders using this software. For this application, the front end of application should be user friendly. It is achieved by using self-explanatory names and icons on the buttons. Appropriate help should be provided for the input of information to reduce input errors. The response time between command and response should be minimum (in nano-seconds). Exception condition/Handling: This includes the actions to be taken for undesired conditions. System produces appropriate messages for undesired conditions. 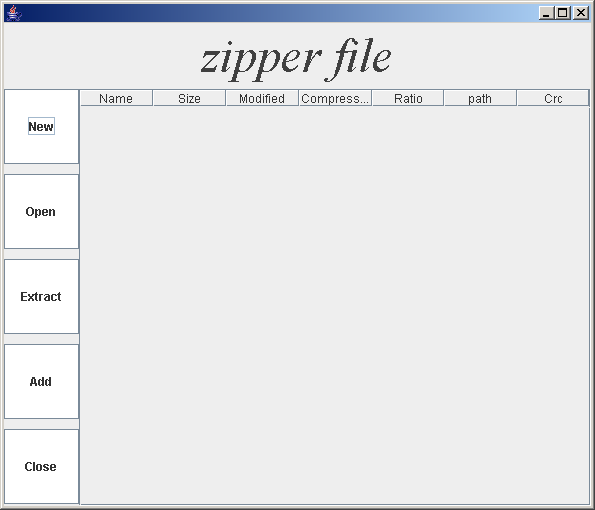 This document intends to provide information about the user interface of the “FileZipper and unzipper utility”. This utility has two parts – the FileZipper part and the File Unzipper part. UI part of both of the utilities are developed using Swing. Initially the first screen (File Zipper ) gets visible in which there are six buttons for choosing various options. This screen also have menu bar to select required option. The screen has one center panel in which a table is added for showing various results. On clicking on New Button, File Save window appears in which we can provide name of new zip file to be created. Once we have given name and press enter, again a new window appears in which we have various options to select files to add in specified zip file. On clicking on Open Button, File Open window appears in which we can provide name of existing zip file for which we want to view the contents of zip. Once we have chosen name of zip file and press enter, detail of zip file entries (files included in zip file) will be displayed in table which is added on first screen (Entry Window). Table shows name of the file, size of the file, last modified date and time, compression ratio and other attributes. Add option can be used for adding more contents either for newly created or existing zip file. On clicking on Add button a new window will appear which have various options for adding more files or directories in the zip file. Extract Button is used for extraction of contents of zip file. This option can be used only when we have opened any zip file otherwise the button will be disabled. On clicking on Extract button a new window will appear by which we can select the contents to extract and specify the folder in which we want to extract. The system developed using JDK1.5 and Oracle fully meets the objectives of the system. The system has reached a steady state where all the bugs have been eliminated and the operators and the users have been thoroughly trained in the operation of the system. The system is operation at the high level of efficiency and all the parties associated with the system understand its advantages. The system solves the problem it was intended to solve as the requirement specification phase. Though the system is completed for the current requirements but its open for future extension. Various future extensions are identified for the system, which might be thought as limitation of the current system. Thus, in the end I would like to conclude that an automated system has become a need for every organization, and sooner or later every one will be compelled to install it due to its numerous advantages.